Three interlocking related novellas focused on Harry Morgan. Harry is not an average retiree. Trouble sticks to Harry like a magnet! What would you do if a dying friend asked you help him rob a bank…not just any bank, but the bank where you do business…and do it like Bonnie and Clyde? And then things really get complicated when the friend’s son, Tony, shows up. Did Laurel Jackson commit suicide or was she murdered? Worse, did Tony Middleton do it? 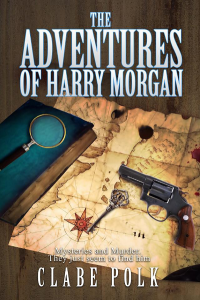 Harry finds himself playing detective, smack dab in the middle of an investigation rubbing up against the bank robbery he is working so hard to forget. Can he solve the mystery, free Tony and get away clean? Harry’s heard all the stories about pirates, old and new, along the Florida coast, As he teaches his friends to sail his new boat, he expects mosquitoes and sand gnats but he never expected to land in the midst of a slave smuggling ring. Now he must find a way to free the captives, keep his friends safe and put the smugglers out of business…before it’s too late. The idea behind this series is that an active older person can still get into trouble and have high adventures even while dealing with the ultimate challenge of all…getting older. In this series, the main character is an active sailor, is intellectually curious and willing to take on challenges to help others or to right wrongs. Harry Morgan is based on me, partially reality, partially a fantasy. The others in the series are simply characters designed to fulfill particular roles in the story. “They robbed a bunch of banks,” Wiley protested. “Yeah, you know, the classic method,” said Wiley.